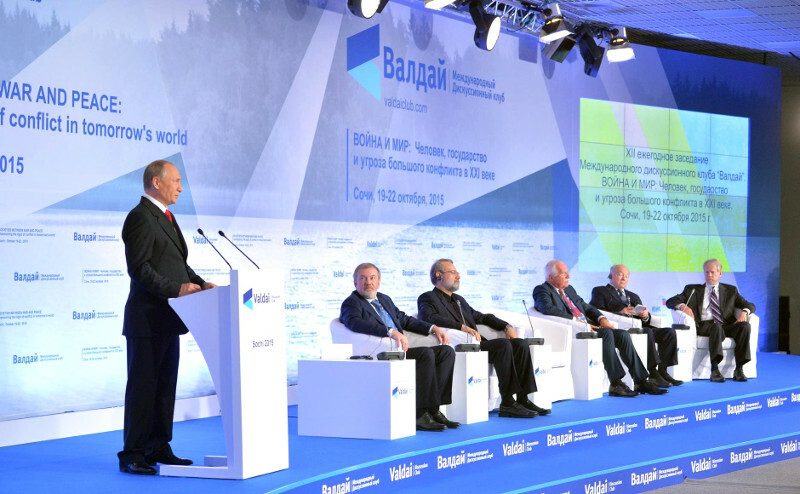 On 22 October President Vladimir Putin took part in the final plenary session of the 12th annual meeting of the Valdai International Discussion Club. This year the discussion focuses on issues of war and peace. This topic has clearly been the concern of humanity throughout its history. Back in ancient times, in antiquity people argued about the nature, the causes of conflicts, about the fair and unfair use of force, of whether wars would always accompany the development of civilisation, broken only by ceasefires, or would the time come when arguments and conflicts are resolved without war. Meanwhile peace, as a state of world politics, has never been stable and did not come of itself. Periods of peace in both European and world history were always been based on securing and maintaining the existing balance of forces. This happened in the 17thcentury in the times of the so-called Peace of Westphalia, which put an end to the Thirty Years’ War. Then in the 19th century, in the time of the Vienna Congress; and again 70 years ago in Yalta, when the victors over Nazism made the decision to set up the United Nations Organisation and lay down the principles of relations between states. Here is what we believe we must do to support long-term settlement in the region, as well as its social, economic and political revival. First of all, free Syria and Iraq’s territories from terrorists and not let them move their activities to other regions. And to do that, we must join all forces – the Iraqi and Syrian regular armies, Kurdish militia, various opposition groups that have actually made a real contribution to fighting terrorists – and coordinate the actions of countries within and outside of the region against terrorism. At the same time, joint anti-terrorist action must certainly be based on international law. The collapse of Syria’s official authorities, for example, will only mobilise terrorists. Right now, instead of undermining them, we must revive them, strengthening state institutions in the conflict zone. I want to remind you that throughout its history, the Middle East has often been an arena for clashes between various empires and powers. They redrew boundaries and reshaped the region’s political structure to suit their tastes and interests. And the consequences were not always good or beneficial for the people living there. Actually, no one even asked their opinion. The last people to find out what was happening in their own nations were the people living in the Middle East. Of course, this begs the question: isn’t it time for the international community to coordinate all its actions with the people who live in these territories? I think that it’s long overdue; these people – like any people – should be treated with respect. We see that contacts are being gradually established between military departments within the anti-terrorist operation framework, although not as actively and quickly as we might like. Approval of the Russian-American document on safety guidelines for the two countries’ military aircraft flying missions over Syria is a serious step in the right direction. I am confident that the experience we acquired and today’s situation will allow us to finally make the right choice – the choice in favour of cooperation, mutual respect and trust, the choice in favour of peace.